When the Sun’s solar winds crash into the Earth’s magnetosphere, we get to enjoy an incredible light show called auroras, or the Northern and Southern Lights. Let’s learn about what causes these incredible phenomena, and the best times and places that you can see them with your own eyes. Atomic oxygen — Single oxygen atoms as compared to oxygen molecules (two oxygen atoms) found in air. Atomic oxygen is found in the upper atmosphere where it has been created by solar radiation. It is extremely reactive and corrodes must materials radidly. Molecular hydrogen is found in the interstellar medium where it is generated by ionization of molecular hydrogen from cosmic rays. It has also been observed in the upper atmosphere of the planet Jupiter. Molecular oxygen is a molecule that is composed of two oxygen atoms that has no color, odor, or taste. It is present in both the atmosphere and the oceans, and solar radiation with wavelengths less than 242 nm can break it back into oxygen atoms. One of these oxygen radicals in turn can combine with O2 to form ozone. Fraser: Astronomy Cast Episode 163 for Monday November 9, 2009, Auroras. Welcome to Astronomy Cast, our weekly facts-based journey through the cosmos, where we help you understand not only what we know, but how we know what we know. My name is Fraser Cain, I’m the publisher of Universe Today, and with me is Dr. Pamela Gay, a professor at Southern Illinois University Edwardsville. Hey, Pamela. Fraser: Good. A little under the weather with H1N1. Pamela: Even the internets can’t escape the swine flu. Fraser: Yeah, I don’t know, it’s been running around my hometown, and my whole family got it. It passed through us pretty quickly. We had a fever for a couple of days… cough that I know is going to stick around for a couple of weeks, but didn’t feel too run down. As flus go, it was no problem at all. Pamela: Well, I really appreciate you putting yourself together to be recording this week, before the holidays. Fraser: Oh, it’s no problem, seriously. I’ll go out and run 5K after this… it’s fine. It’s funny because you remember how sick I was last year, but this year… even though I’ve got swine flu, it’s no problem at all. So, when the sun’s solar winds crash into the earth’s magnetosphere, we get to enjoy an incredible light show called the aurora… or the northern and southern lights. Let’s learn about what causes these incredible phenomenon, and the best places and times that you can see them with your own eyes. Alright, now Pamela, have you ever seen an aurora with your own eyes? Pamela: I have… and they’re really creepy. When I was a small child, I saw the northern lights and they looked like Scooby Doo ghosts, except no human being inside. It completely freaked me out. But when I got older, I learned to sit in the backyard with a beer and appreciate them. Fraser: But, you’re not that far north, right, so not a very easy time to see them. Pamela: Well, each of the times I’ve seen them I’ve been up in the northeast… either in Massachusetts as a kid or up in New Hampshire with some friends one summer. Pamela: Well, and it moves and changes color, and depending on where you are, it may just appear as this white sheen in the sky. Fraser: Yeah, and so you’re not quite sure if that’s what you’re seeing… then it moves a bit, and you’re not sure if your eyes are playing tricks on you… So there are times when you really see it and there’s no question that that’s what it is, and then other times when it’s kind of hard to make it out. So hopefully with this episode, we’ll be able to bring in all the latest science and give you a much better shot at being able to see the auroras for yourself. So what’s the underlying phenomenon? What’s going on here? Pamela: Well, at the end of the day, the problem is that the earth has a magnetic field line, and when high-energy particles, or in fact any particles, from the solar wind interact with this magnetic field, the charged particles will tend to follow the magnetic field lines back down toward the surface of the earth. As they collide with things in the atmosphere, you end up with a light show. I guess the best starting point is to imagine one of those little iron filing magnet things that many of us played with as kids or that we saw in our textbooks. If you take a bar magnet, and the earth is basically a bar magnet, and you move it through iron filings, you get these arcs that go from the north magnetic pole to the south magnetic pole, forming ever-increasing loops. That’s what our Earth has, and those loops, they connect up to the surface of the earth at the north and south pole, and then extend out great distances beyond even our atmosphere. Fraser: Right, and I think we’ve seen the pictures online and in books and stuff of where it really looks like someone has put a bar magnet right in the middle of the earth, and then it has the lines—the magnetic field lines—going from the north pole back over to the south pole in concentric rings… semi-circles. But the way the pictures go, they’re sort of flattened on one side and more like a tail on the other side. Pamela: Now, one of the things that I get to teach in physics is that any time you have a moving charged particle moving through a magnetic field, it’s going to get accelerated by that magnetic field. In fact, its direction can get changed. This is how, in some cases, mass spectrometers work is you take charged atoms and fire them through a known magnetic field, and if they have a set velocity and you know the magnetic field that they’re moving into, they’ll get arced towards a detector. You can figure out how much they weigh by how much they’re arced. Pamela: Right, in fact lots and lots of everyday experience—from CSI to how you watch CSI—is all made possible by what happens when you move charged particles through a magnetic field. Now with the planet earth, we’re one giant magnetic field. And in fact the sun also generates one gianter magnetic field. Charged particles moving from the sun out away from the sun will travel out along magnetic fields. Fraser: And, sorry… so what are these particles, then? Pamela: Well, they’re electrons, they’re protons, in a few cases they’re charged ions… heavier nuclei that have had electrons stripped off of them for various processes. They’re just particles… the same sort of stuff you find making up everything around you. Just strip off a few electrons and send them flying loose through space. Fraser: But the trick is… strip off a few electrons, right? Pamela: Right. So they’re not neutral, and often they’re accelerated to rather ludicrous velocities by the sun. So you have these high-speed charged particles moving from the sun towards the earth. And when the magnetic fields are just right, they’ll travel along the sun’s magnetic fields, and then get tangled up in the earth’s magnetic fields, and plunge down along the magnetic field line through the atmosphere. Fraser: Now will they go through one or the other? Like, will they go… if they’re oriented one way they’ll go to the north pole, and if they’re oriented the other way they’ll go to the south pole? Pamela: Well, the way it works is it’s all one large coupled system. It depends in large part where they came off of the surface of the sun. So you’ll end up, a couple times a year… around the equinoxes, actually, and we’re still trying to figure out why this happens… but around the equinoxes, the magnetic fields of the earth and the sun are lined up just right that they end up tangling together. Depending on where the particles came off of the sun, they’ll travel either toward the north or toward the southern poles. Now what’s neat is when you get a really large solar event it just blasts radiation in our direction, and we’ll end up with aurora on both poles of the earth. Fraser: Right, ok… so I think I’ve got the story so far… you’ve got a stream of particles constantly coming off the sun, right? That’s the solar wind. It’s making its way through space, and it’s got a charge because it’s had some electrons stripped off of these particles, and it also had a certain magnetic field alignment thanks to wherever it was on the sun when it came off. It sort of retains that magnetic alignment and then it makes its way to the earth. Then it interacts with the earth’s magnetic field and dives into one of the poles. Then as it comes through… I guess the part that I don’t really understand is where does the light show part come from? Pamela: Well, the light show actually comes from stuff that’s in our atmosphere. As these high-energy particles are blasting through our atmosphere, they have a chance to hit an atom here or there. Our atmosphere is filled with things that give off light when you hit them just right. We have atomic oxygen which gives off red light. We have molecular nitrogen which is blue and molecular oxygen which is green. What happens is you’ll end up with one of these high-energy particles whipping itself into say an atomic oxygen molecule. And when this happens, one of the electrons in the atomic oxygen molecule can jump to a higher energy level. So now we have excited atomic oxygen in the upper levels of the atmosphere. That excited atomic oxygen can only stay excited so long. Then it drops to a lower energy level. When it drops to a lower energy level, it gives off a very precise photon of color, a very precise, in this case, red photon of color. And that is what we see as the red aurora that seems to always be the northern-most part of the aurora. That is where the aurora has first started in the highest parts of the atmosphere. 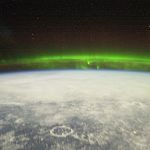 Fraser: Ok, sorry, so the solar wind particles are actually slamming into the various parts of the atmosphere, boosting up their energy level, and then they drop back down and give off photons at that very specific frequency… and that’s what we see. Pamela: And what we see depends on where in the atmosphere the atoms and molecules are getting excited. So, the atomic oxygen… it’s getting excited at the highest possible levels of the atmosphere. The green color… this is often the most predominant color in an aurora… the green emission is coming from molecular oxygen. These are molecules all throughout our atmosphere and when they get hit, they decay rather quickly. So, after about three-fourths of a second, an excited molecular oxygen molecule is going to give off green light and you end up with these huge… what look like curtains of green light… moving through the sky where the high-energy particles are passing through. These are also occurring at all sorts of different density levels. Now the reason that you get this at so many different places is that this is a fast transition… you whack a molecule, and it goes… oh, I’m excited…. and then it really fast says… no, I’m not… three-fourths of a second later. I can’t even say it as fast as it does it. Then it gives off that energy. With the atomic oxygen that’s giving off the red light, it stays excited for about 2 minutes. Now the problem with that is… in those 2 minutes, something else could whack the atomic oxygen. The denser the atmosphere you’re looking at, the higher the probability of some sort of a collision happening. If that collision happens, it’s going to change the energy of the oxygen and you’re going to end up not necessarily having that pretty, red photon. Instead, you might end up with some sort of kinetic energy going into the system. You can have all sorts of different things happening. Fraser: Could you boost it higher and higher without it actually being able to drop back down? Pamela: In theory, yes, but we don’t have the densities or the energies in the atmosphere. So it’s just the probability of one lone atom getting whacked over and over and over. It’s just too low of a probability. Fraser: Right. So just a fraction of the atoms are actually being struck, so the chances of the same one being hit is pretty rare. Pamela: Now at the same time we also end up with these blue highlights and that’s all coming from nitrogen emission in our atmosphere. We can end up with all these amazing combinations of color. And exactly how you see it depends, in part, on what’s going on and where you are. So what’s amazing is the photos that the people up on the International Space Station are able to take. Here on the planet Earth we see what we perceive is three-dimensional structure, but we’re never quite sure. It looks like curtains in the sky, but hey… we’re just looking up at the sky, which is really a flat surface. But if you’re able to look down on the aurora, there’re literally these bands of vertical illumination coming up through the atmosphere marking where these waves of solar wind have flown all the way from the sun to the earth’s magnetic field and have just followed these planes of magnetic field lines and now they’re hitting Earth’s atmosphere causing brilliant illumination. Fraser: Yeah… wow. Yeah, I’ve seen… there’s some amazing pictures that you could see taken by astronauts. And then this same process is being seen on other planets, as well. Pamela: Anywhere you have an atmosphere and a magnetic field, you can end up seeing aurora. Perhaps the most amazing images that have so far been seen are those of Jupiter. Jupiter has these amazing brilliant aurorae around its northern and southern poles. We have really good images of this from the Galileo spacecraft. Fraser: And Saturn has them, too. Pamela: And Io… even the little Galilean moon of Jupiter, because it has this amazing combination of active magnetic fields and atmosphere, it just lights up with aurorae. Fraser: So I guess there’s just sort of a background chance… there’s always a bit of an aurora must be going on because the solar wind is constantly streaming off of the sun and constantly reaching the earth. But it’s not that strong, right? I mean you’ve got to be pretty close up to the north or south pole to be able to see much, right? Pamela: And the truth is if you live far enough north, almost any time that it’s dark and it’s moonless and it’s clear… because these things are faint, so you need to get rid of the moon, you need to get rid of any clouds, and you need to have the sun fully out of the sky… no twilight going on. But, if you get rid of all of those these three things, pretty much any night of the year you can see some amount of aurora. But these giant gorgeous aurora displays that we see pictures of in post cards and astronomy books, those are almost always tied to coronal mass ejections. These are times when you end up with a loop of magnetic field poking up from the surface of the sun. It lets loose with all of its energy and all of the particles that were contained within this tangled loop of magnetic field. And if the alignments are just right, it shoots those particles at the planet Earth at high velocities, and they get tangled up in the earth’s magnetic field and can end up causing aurorae all the way down to the middle latitudes of the planet Earth. Fraser: Right, and so most people… if they’ve seen an aurora… chances are you’re seeing one that is the result of one of these coronal mass ejections. Pamela: So this is where sunspots start to become so interesting because a lot of times these coronal mass ejections are tied in with some of the really big, beautiful sunspot complexes… so when you start developing these giant sunspots, then you start to increase the probability that… hey, maybe we’re going to get a big flare…. maybe we’re going to get a big coronal mass ejection… which, again, increases the probability of… hey, maybe we’re going to have awesome aurorae. And there’s all sorts of different of websites that are dedicated to looking at space weather, like spaceweather.com, where you can go and you can find out what is tonight’s aurora prediction. Fraser: Yeah… what is the space weather? I love that you can look up the space weather and get a sense of how the weather’s going to be. You know, for us it’s no real big impact on our daily lives, but you can imagine for future astronauts who are going to make that trip from the earth to the moon being very careful about the space weather. Making sure that there isn’t a big sunspot pointing right at the earth before they make that trip. Pamela: And that’s where all of this starts to become so important… the same thing that causes beautiful auroral displays on the surface of the planet can wreak havoc on the astronauts’ lives. The highest levels of our atmosphere just start to touch where the International Space Station is orbiting, about 300 miles up. And so when we’re watching these aurorae, sometimes a very high aurora can be seen as high as 350 miles. This means that the space shuttle can actually, if the orbits are just right, fly through a sheet of the northern lights or the southern lights. And that’s kind of amazing to think about, but the magnetic fields that are tied into this… the high-energy particles that are tied into this… there’s a lot of energy stored up in this. In fact there’s a historical case of at one point in the 1800s, there were telegraph operators who during the middle of a particularly violent aurora period where there’s amazing solar winds hitting the earth’s magnetic field, this violently changing magnetic field induced so much current in the telegraph lines that they found that their batteries were causing interference. So they unhooked their batteries for hours and just worked the telegraphs like normal using nothing but the energy generated by the oscillating magnetic field. Fraser: Wow! That’s a lot of power. Thanks, Sun! So then let’s sort of think of this over time… We’ve got a fairly active sun happening… right now we were on the solar minimum and now we’re moving ourselves towards the solar maximum, which is supposed to be in 2012! So in 2012 we should hit solar max with way more sunspots on the sun, and we’ll be able to see those sunspots crossing… or, I guess the sun is rotating… we’ll be able to see those sunspots as they make their way across the surface of the sun… they’re not moving, the sun is rotating… but anyway, we’re going to get into situations, right, where one of these big sunspot complexes is perfectly aligned directly towards the earth. Then you get an x-ray flash, you get this great big coronal mass ejection coming out, and a release of particles towards the earth. So, then let’s say that that happens… how long does it take for the particles to get from the sun to the earth? Pamela: It can be anywhere from a few tens of minutes to a few hours to a couple of days. It all depends on how much power is charged up. Now the problem is the really high speed ones, the ones that arrive in tens of minutes vs. in a couple of days, they’re the ones that are most dangerous. This is where space weather forecasting starts to become very important, and also where missions like STEREO become very important. What’s awesome about STEREO is when it’s on the same side of the sun… when the two missions are on the same side of the sun as the planet Earth… they can give us a three-dimensional view of these coronal mass ejections as the mass ejections pass between the two little spaceships. And with a spaceship on either side, we’re able to measure the position of the coronal mass ejection relative to the stars from both sides and go… oh, I know exactly where that coronal mass ejection is going… Earth is fine. Or, oh no, we need to get the earth locked down into safety mode. Let’s get all the satellites tidied up, let’s get all the astronauts back down to the planet Earth… if we have time. So we do look for ways to mitigate the possible badness. One of the strange things that we actually have to think about is how much electricity is being carried on our power lines. The same event that caused the telegraph officers to be able to work their machines without batteries plugged in… today would be devastating to the power grid. When we built the North American power grid… all those power lines that make my house and yours light up across North America… we didn’t realize how much electricity it would some day need to carry. The more current you run through the wires, the more they stretch. If you stretch them too much, they break. So they were designed to be carried with about 80% full load, where full load is the point at which they break. Now a good coronal mass ejection will oscillate the earth’s magnetic field violently. That will create current in those power lines… this is all sorts of complicated physics… we can do an entire show, eventually, dedicated to just this particular effect. But, that changing magnetic field creates current and if you create too much current artificially from coronal mass ejections you start breaking power lines all over North America. This is actually something Phil talks about in his book Death From the Skies. It’s not as big a concern for the astronauts… we can predict… we can lock them into safe places… they’ll be sad, but they should—if we have warning—be ok. But trying to dump enough power off the power grid rapidly so that all the wires are safe, all the power lines are safe… that’s a bit trickier because now you’re starting to deal with all sorts of different nations across the globe all going… ok, less power, less power, less power… and that’s harder to do. Fraser: But with the modern satellite age… especially with STEREO now… scientists are getting pretty good at predicting when a good light show is probably going to happen… and even how far south people… or north, if you’re trying to see the southern lights… how far away from the pole you can be to actually still see a pretty good light show. And I remember… this happened during the last solar maximum… there were some pretty big events and there were some really good predictions. I was writing a bunch of stories on Universe Today and we were saying… ok, tonight, give it a shot… go outside… look up… and you should see some really great auroras. Then report back to me, and I had lots of people email me… I was in Scotland… I was in England… I was as far south as Texas. People were seeing them all over the world, and it was really great because finally I could say… oh, go outside, go look, and tell me if you see it. We had it here… my dad was telling me about it on Hornby… So there is… so this time around… when 2012 comes around, we should… the world’s not going to end… but we should get really beautiful light shows again, which I think is way better. Pamela: There’s actually some tour companies that have northern light tours. Some of the best places to go are Alaska and Scandinavia. Pick one… it really doesn’t matter… both of them will make you cold and happy, hopefully. The two ways of looking at them… one is you go up in airplanes and you look through your windows… I don’t think that one is quite the way I want to do it, but I know there’s lots of people that go out and observe the northern lights that way. The other way is to go get yourself someplace far enough north and with a friendly enough bellman that when the northern lights come out, they phone up to your room and tell you to get out of bed and come look. I actually got to see that in Anchorage, Alaska, a few years ago with a meeting of the American Association of Physics Teachers. We all signed up with the hotel bellman, and when the lights started up that night, he called all of our rooms and we all bustled out to the parking lot where the lights were turned off. We all stood and looked out over the mountains at these amazing displays. Pamela: You can get lucky any time of year. Fraser: Yeah, it’s amazing what you can see… if you just show up. Go look for meteors, and if you’re lucky, you might see the northern lights, as well. Pamela: And one neat way to plan it might be to go see the Leonids somewhere really far north… the big November meteor shower. Because these do tend to show up more around the equinoxes… November is fairly close to an equinox. Another good time to go looking when a lot of the tours are is February and March. Fraser: And also, stay tuned to the space weather site, because they do a great job of warning when really big coronal mass ejections have been fired at the earth. So you can kind of know the time frame when you should go out and try to watch them. And when they’re really spectacular, you can see them all the way… anywhere in Europe… anywhere almost in the United States… almost anywhere in Asia. So when it’s really going, in a couple of years from now, you should be able to see them if you want to. Pamela: And the best way to record what you’re seeing is to get yourself a digital SLR camera… something like the Canon EOS Rebel, or similar cameras… something that allows you to have a longer exposure, something that does automatic dark current correction, which is just removing any random electrons you have bouncing around as a standard background level in your camera. Good cameras can make corrections for the background bouncing-around electrons. Go out, record it with a camera, sit back and enjoy. Then when you look at your pictures later go… wow, the camera saw so much more than I did. That’s the sad part, but you can see really cool stuff, too. Warn your little kids what’s going on, otherwise they’re going to be freaking out. But, it’s an amazing experience neither you nor your family will ever forget. Fraser: Yeah, it’s one of those astronomy holidays that you’ve got to put on the list. In fact, I’m going to go put it on my list right now. Fraser: Alright, well, thanks a lot, Pamela! We’ll talk to you later.